The sensible beginning of Nipissing took place about 12,000 years ago as the last Ice-Age glacier receded northward over the Pre-Cambrian Shield. Being hundreds of feet thick, the weight of ice had depressed the bedrock downward into the earth's mantle. As the ice melted, the bedrock rose upward and is still rising at roughly a half inch per year. Initially, the Atlantic flowed up the Ottawa and St Lawrence valleys over Nipissing and Georgian Bay and most of the Great Lakes. This massive body of water, which existed for thousands of years, was called Pangea, part of the North American continent. As the land continued to rise and the Atlantic receded down the river valleys to the east, the water flowed eastward from Georgian Bay, up along the valley of the French River, across Lake Nipissing, and down the Mattawa River to the Ottawa. As the land elevation rose even higher, it formed a sixty-foot "watershed" running southeast, northwest near North Bay between Lakes Nipissing and Trout Lake (the headwaters of the Mattawa). 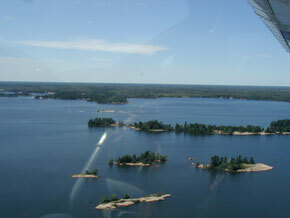 Lake Nipissing, Big Water or "Gichn-bee" in Ojibwa, is Ontario's fifth largest lake after Lake Nipigon, Lake-of-the-Woods, Lac Seul and Lake Abitibi. While it is nearly 60 miles long from Barlow Lake to Callander Bay, and about 16 miles wide at its widest, it covers an area of 336 square miles. 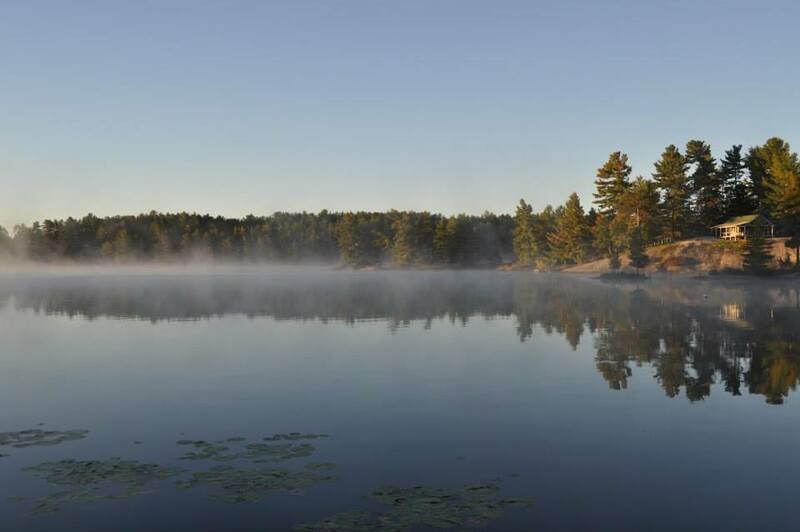 The average depth of Lake Nipissing is only 20 feet with a maximum depth of 173 feet near the mouth of the French River. 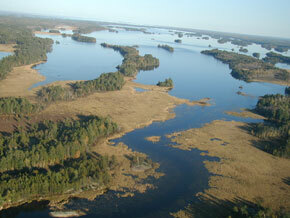 In 1611, the first European to discover the lake was Etienne Brule, an associate of Champlain. Until around 1850, the Ottawa, Mattawa, Lake Nipissing and the French River systems served as the main highway for fur traders, missionaries, explorers and all manner of commerce to and from the western heart of the continent. With the arrival of the CPR in the late 1800's, a number of logging companies moved into the area to harvest the vast pine forests surrounding Lake Nipissing and Georgian Bay. One of the more prominent was the JR Booth Company from Ottawa with huge cutting limits throughout the area. He erected dams on all of the rivers flowing into Nipissing so that the spring freshets would more readily move the winter cut logs into the Lake. Once in the Lake, the logs were boomed and towed by steam tug either to various mills or to a large water-powered jack ladder at Wisi Wasi near Callander where they were hoisted onto rail cars for onward transport to Astorville on Lake Nosbonsing either for milling or further water transport to the Mattawa and Ottawa Rivers. All of the lumber companies on or near Lake Nipissing operated numerous steam-powered tugs, "alligator" warping or booming tugs, and large passenger/freight vessels. The grandest of these was the Booth, which was over 140 feet in length. At this point in Lake Nipissing's colorful history, all lake water flowed freely down the French River, 80 miles with an accompanying drop of 60 feet to Georgian Bay. The seasonal wildly fluctuating water levels in the Lake and River were more than a little bothersome to logging interests and area residents alike. Accordingly, between the timber barons and area governments, dams were built at Chaudière Falls on the French and at Little Chaudière on the Little French by 1909. This had the effect of regulating the Lake Nipissing water level to about seven feet higher than it's former level over most of the year. However, just as at present, Hall Chute and the Free-Flowing Channel into the Little French are unregulated but are of little consequence to overall outflows. 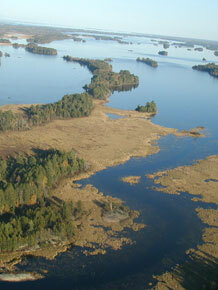 This added depth to the Lake meant that larger boats could penetrate further into the interior forests. Indeed, with the flooding of the Amawateekea River beyond the West Arm (at Hwy #535) logging vessels could reach the eastern end of Barlow Lake. A concrete weir was built on the Barlow outlet to raise its level to better permit the alligator tugs to boom logs along its length to Nipissing. Our local people realized an even greater benefit when the Big and Little Cuts were blasted between Lake Nipissing and Chanter Lake around 1909 to give Monetville and our pioneer's lake access to Sturgeon Falls via the docks at "Shanty" Bay. Better control of outflows were realized when Jack Garland of North Bay promised that if elected to parliament in the 1948 election he would construct the Portage Dam at Dokis. He did just that by 1951. There are 38 dams controlling the inflows and outflows of Lake Nipissing, the French, Pickerel, Wahnapitae, Sturgeon and South Rivers. They are owned by a number of agencies such as Ontario Hydro, MNR, Sturgeon Falls Hydro, and Public Works and Government Services of Canada (PWGSC). This federal agency has the task of coordinating flows and levels of the various bodies of water over the nearly 4,000 square miles of watershed! Most of the dams are automated and are operated from the PWGSC offices in Toronto with close reference to numerous permanent water level stations and local interest groups. We must understand that Lake Nipissing interests get top priority over other users in adjusting water levels because most of the population base is on the Lake littoral. Within this context, the range of levels over the year at Wolsely Bay can be as much as nine feet, 13 feet at Dry Pine Bay and up to 16 feet at Hartley Bay. Nipissing experiences an annual range of up to 40 inches while levels are controlled within a range of 18 inches during the boating season.